First sock of the summer! I have modified the pattern just slightly — knit the ribbing a little shorter than the pattern called for, knit the leg shorter than the pattern called for, and I did a toe that decreases only along the sides and finished off with kitchener stitch instead of decreasing all the way around and doing a thread-through-pull-tight finish. The pattern is extremely easy to memorize. Basically just the same few stitches repeating around the sock, and it shifts over one stitch for each pattern round to create the spiral. 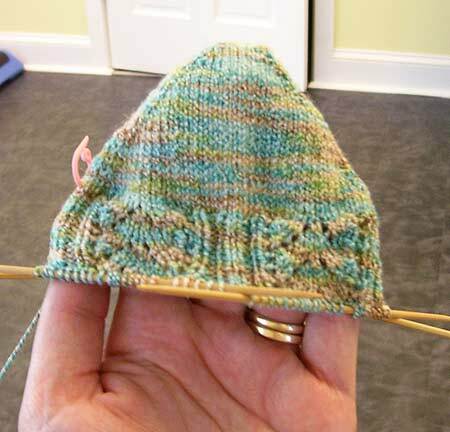 Plus the whole sole of the sock is stockinette, so that gives you a bit of a break once you get to the foot. There were a few times where I had to tink anywhere between half a row to two rows, but it was always because I zoned out and screwed something up, not anything to do with the pattern. So I was happily knitting along on the Anklets For Meeeee! 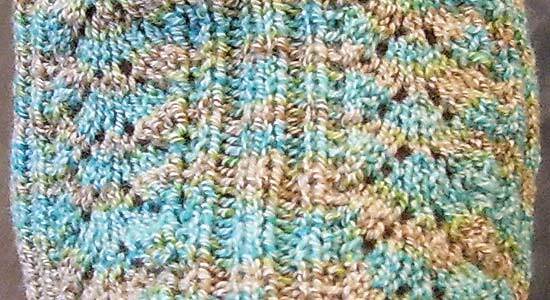 last weekend after posting that very promising foot-halfway-done photo on the blog… heck, I even finished the first sock! I knit the entire heel plus most of the cuff during the ride to and from my SIL’s house last Sunday (3 hrs round trip). I finished it up at home and tried it on… whoops. Strange, it seems like there’s too much fabric around the front of the ankle and the back barely stays up on my heel. Wow, it’s actually lower in the back… that’s even weirder. What the heck did I do wrong here? DING. What I did wrong was divide the instep and sole stitches unevenly, and continued that up through the heel. In order to get the pattern to work out the way I wanted it to on the instep, I had 44 stitches over the instep and 32 stitches around the sole (and the heel). More stitches = more fabric. Less stitches = less fabric. Thus, baggy in the front and droopy in the back. Also, I thought the finished sock felt a little too loose overall, and I made it too long (due to the elastic in this yarn — Paton’s Stretch Socks — you can get away with making a tighter sock). The other bummer after the first sock was finished came when I weighed the remaining yarn — my first sock used up just a bit more than half the ball (a bit meaning a few grams). So I went back to the drawing board on Monday and figured out how to arrange the stitch pattern so I’d have an equal number on instep and sole (and heel), and still fit in the ribbing in a way I liked, while using fewer total stitches around the whole foot to snug it up a little more. So I cast on for the promising second sock on Tuesday night. I was hoping that having fewer total stitches and knitting the foot a little shorter would allow me to get a whole sock out of the remainder of the yarn. Unfortunately, that was not the case (as I discovered just before midnight on Friday night). I had to finish off the cuff with some of the yarn from the first sock. So now the second sock — the new “first” sock — is finished and it weighs exactly 25 grams. Which would lead you to believe I can certainly get another sock out of the other half of a 50-gram ball of yarn. However, the ball of yarn actually weighed 49 grams before I started. I’m determined to get a full pair of anklets out of this one ball of yarn. Fortunately, the fit (lengthwise) is still a tad loose, so I’m going to knit a shorter foot (1 or 2 pattern repeats shorter, which comes out to about .5″ to 1″ shorter). Someone with feet smaller than US ladies size 9 who prefers a snug sock could most likely get a pair of anklets out of one ball of this stuff, depending on the pattern used. For my size 9 feet, however, it will be a challenge… but I think it can be done. In other news… Sock Wars has ended. The winner has been drawn. I’m still waiting to receive a finished pair of socks (and I think there may be some confusion as to who my final assassin was). But I’m not too concerned at this point (actually, I don’t think I’ll ever be “concerned” — they’re just socks, after all!). Meanwhile, I have the second anklet to finish and it’s time to dive right into Summer of Socks! …or so they say. Today, the surviving sock warriors received an email from the Supreme Commander calling for a mail-in finish to the game. Here’s how it works: each surviving warrior mails a postcard – letter – package – whatever to the Supreme Commander (in Ireland). The winner will be drawn at random from the mail received up to and including June 21. (Um, that’s a week from tomorrow. Since I really don’t want to spend the money to express or priority ship a postcard to Ireland from here in little old Pennsylvania, I’m not sure my entry will make it there in time.) Yeah, I’m ready to be done with Sock Wars, but I’m disappointed that it’s ending this way, particularly because there are still over 300 warriors still in the game. Everyone is still expected to receive a pair of finished socks, whether from the current assassin working on them, or from a valkyrie (volunteers knitting socks for those who haven’t received any by July 31). So, knowing that the end is near, I’m continuing with my Anklets for Meeeee! The foot is coming along nicely, but slowly (compared to my previous — and limited — sock-knitting experiences). It’s the purling, I think. Some might say the DPNs are slowing me down, but I don’t think that’s as much of a factor as the purling. And hey, I just started these Sunday afternoon, so relatively speaking it’s not necessarily going all that slow. So, with Sock Wars winding down now (sadly), I will focus on preparations for lots and lots of sock knitting mixed up with a little non-sock gift knitting this summer. One week from tomorrow, Summer of Socks kicks off! I think that little exchange will be happening a lot over the next few months. Just heard from my brand-new Sock Wars assassin and she had some sorta good/sorta bad news… she received the SIPs from my original assassin (her target) and they were knit with yarn that was too heavy for the required gauge. Fortunately, the socks weren’t very far along. But my poor dear assassin just could not knit with the yarn. Last I heard, she is waiting for a ruling from the Supreme Commander regarding starting over with a more appropriate yarn. So, it’s good news that it will buy me some time for SIPs to get here from my target’s target in Canada… and bad news that I will probably be knitting Detonators a bit longer. But in the meantime, I have Anklets for Meeeee! to work on. Yes, that is what I’m officially calling them. Anklets for Meeeee! Note the required five “Es” and exclamation point. I’m liking how the pattern is shaping up so far. (Click the picture at left to see a closer view.) These are by far the most fiddly socks I’ve made (I’ve yet to try Monkey, Pomatomus, or anything lacy — these are only mildly lacy). Knits and purls and K2togs and SKPs and YOs… oh my. At least on the foot section I’m giving myself a break with all stockinette on the sole. But on the instep and leg, even when it’s one of the odd-numbered rows that doesn’t have any of the fiddly K2togs, SKPs and YOs on it, I’m still messing with knits and purls. And I’m still liking the DPNs, of all things! It’s kind of fun knitting with glorified oversized toothpicks. No kidding. 2nd pair of Detonators… done! Tick… tick… tick… tick… BOOM. My second pair of Detonators for Sock Wars are finished! They were started by my target, Seussy. I received them from her on May 23, just in time for Memorial Day weekend. She had gotten about halfway through (or maybe a little more) the first sock. I finished that first sock on Memorial Day, but didn’t get to cast on the second sock until Thursday, May 29. Plugged away at them little by little over the next week, and then totally knocked out the foot from the end of the gusset decreases all the way to just before the toe decreases yesterday. Quickly finished up the toe today, washed ’em, and voila! Second pair of Detonators filed in the done pile. Now they will have to make the long journey across the country and across the border to my target’s target, Beagle, in Vancouver, British Columbia (that’s Canada, eh!). As I said in yesterday’s post, I will be a sitting duck while these socks make their way to Vancouver and while I wait for Beagle’s SIPs to make their journey over the border and across the USA to me. I’m pretty sure I must be close to being knocked off — I mean, it’s been a month, the sock bomb destined for me is either with or on its way to its second assassin to be finished off. I have no idea how long the mailing time will be to Vancouver and back, but I’m guessing I’ll be waiting for SIPs for at least a week and a half to two weeks. So, what to do while I wait? Knit more socks, of course. But the difference is, these are for meeeee! I want to make some socks for meeeee again! I was at Yarns R Us for a couple hours yesterday (working on the second pair of Detonators, of course) and during a little break from the knitting I checked out the new sock yarn stock Kim had on the shelves (hey, I hadn’t been there for three whole weeks). I spotted plenty of Cherry Tree Hill I’d love to use, but I already have a bit of a wool sock yarn stash developing and, um, it’s practically summer already. Our first heat wave has already started. I need something with cotton in it. Well, I spotted some Paton’s Stretch Socks on the shelf. I didn’t remember ever seeing it at the shop before, and the words “cotton blend” and “elastic” really caught my eye (pretty colors, too). One ball is about 239 yards, so I figure I can get a pair of anklets out of it. Anklets are great for trying new stuff out — quicker than a full-size pair of socks, you don’t need as much yarn, blah blah blah. 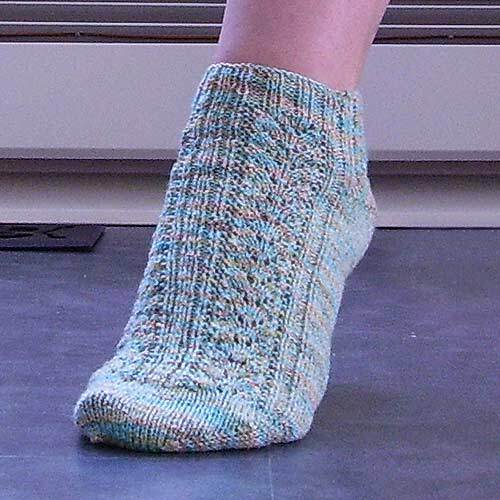 Plus, I want to wait for Summer of Socks to start before casting on any full-size socks. Might as well do any “ineligible” stuff in the interim. I also bought a set of sock double-pointed needles (DPNs). I have only ever used DPNs before for 1) finishing off a hat when there were too few stitches to fit around a 16″ circular, or 2) knitting i-cord. Since I lean a little more to the side of being a process knitter more than a product knitter, I felt I should at least try to knit a pair of socks on DPNs. Almost as soon as I finished off the second pair of Detonators today, I grabbed the brand-spankin’-new DPNs and sock yarn and headed off to the computer to learn Judy’s Magic Cast On so I could start the anklets toe-up. I already have a stitch pattern picked out from The Complete Book of Knitting, so as soon as I figure out my stitch count for around the foot and leg and I’m ready to go. And P.S. — so far, I’m actually liking the DPNs. Shhh… don’t tell the magic loop people! Still working on my target’s SIPs for Sock Wars III. I managed to finish up the first sock over Memorial Day weekend, but I haven’t finished the second sock yet (getting close, though!). I have checked back in the warrior listing, and my assassin is out of the game (lucky her, she has a pair of finished socks!). So, assuming I finish the SIPs that are destined for my target’s target before my new assassin finishes her target’s socks for me, there’s still the issue of my target’s target being in Canada. The longer the mail takes, the longer I am a sitting duck! Relay For Life went pretty well last weekend. That is, except for it being cut 3 hours short due to the fire company’s anniversary parade (why the borough let them be scheduled the same weekend, I have no clue). And except for it being cut about 1 MORE hour short of that due to thunderstorms. We all got pretty drenched packing up and loading stuff back in our cars. I ended up not taking along the awareness ribbon dishcloths to sell — I only managed to get four done. I think I’ll work on more over the next year and sell them for a fundraiser at the 2009 Relay. Also got my deadline weaving done — a lap blanket for the Relay For Life raffle. One of the young girls from church won it (her mom and I are the same age) and I think she’ll really like it. Heck, she’s still young enough to use it as a full-size blanket!